To reduce the development of drug-resistant bacteria and maintain the effectiveness of PIPRANEM and other antibacterial drugs, PIPRANEM should be used only to treat or prevent infections that are proven or strongly suspected to be caused by bacteria. PIPRANEM (piperacillin and tazobactam) for Injection and PIPRANEM (piperacillin and tazobactam) Injection are injectable antibacterial combination products consisting of the semisynthetic antibacterial piperacillin sodium and the β-lactamase inhibitor tazobactam sodium for intravenous administration. Each PIPRANEM 2.25 g single dose vial contains an amount of drug sufficient for withdrawal of piperacillin sodium equivalent to 2 grams of piperacillin and tazobactam sodium equivalent to 0.25 g of tazobactam. The product also contains 0.5 mg of EDTA per vial. Each PIPRANEM 3.375 g single dose vial contains an amount of drug sufficient for withdrawal of piperacillin sodium equivalent to 3 grams of piperacillin and tazobactam sodium equivalent to 0.375 g of tazobactam. The product also contains 0.75 mg of EDTA per vial. 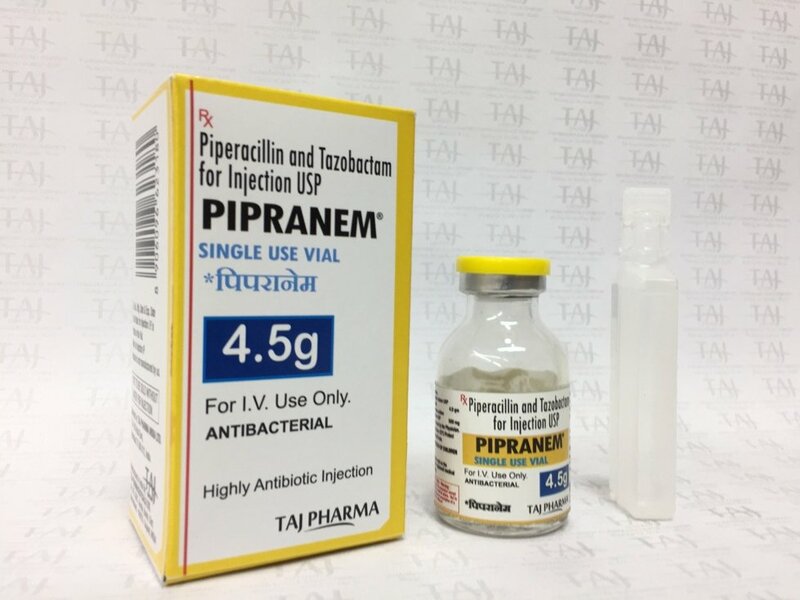 Each PIPRANEM 4.5 g single dose vial contains an amount of drug sufficient for withdrawal of piperacillin sodium equivalent to 4 grams of piperacillin and tazobactam sodium equivalent to 0.5 g of tazobactam. The product also contains 1 mg of EDTA per vial. Each PIPRANEM 40.5 g pharmacy bulk vial contains piperacillin sodium equivalent to 36 grams of piperacillin and tazobactam sodium equivalent to 4.5 g of tazobactam sufficient for delivery of multiple doses. PIPRANEM contains a total of 2.84 mEq (65 mg) of sodium (Na+) per gram of piperacillin in the combination product. What is piperacillin and tazobactam (PIPRANEM)? Piperacillin is a penicillin antibiotic that fights bacteria in the body. Tazobactam is an antibiotic similar to a penicillin that fights bacteria in the body. What are the possible side effects of piperacillin and tazobactam (PIPRANEM)? What is the most important information I should know about piperacillin and tazobactam (PIPRANEM)? You should not use this medication if you are allergic to piperacillin and tazobactam or to any other penicillin antibiotic, such as amoxicillin (Amoxil, Augmentin, Dispermox, Moxatag), ampicillin (Principen, Unasyn), dicloxacillin (Dycill, Dynapen), oxacillin (Bactocill), ticarcillin (Timentin), or penicillin (Bicillin L-A, PC Pen VK, Pfizerpen), and others. Before using piperacillin and tazobactam tell your doctor if you have kidney disease, a bleeding or blood clotting disorder, low levels of potassium in your blood, cystic fibrosis, a history of allergies, if you are on a low-salt diet, or if you are allergic to a cephalosporin antibiotic such as cefdinir (Omnicef), cefprozil (Cefzil), cefuroxime (Ceftin), cephalexin (Keflex), and others. Piperacillin and tazobactam may cause bleeding, especially in people with kidney disease or using certain medicines. Tell your doctor if you are using any medication to prevent blood clots such as alteplase (Activase), bivalirudin (Angiomax), clopidogrel (Plavix), dabigatran (Pradaxa), dipyridamole (Persantine, Aggrenox), enoxaparin (Lovenox), fondaparinux (Arixtra), heparin, tenecteplase (TNKase), ticlopidine (Ticlid), tinzaparin (Innohep), warfarin (Coumadin, Jantoven), and others. What should I discuss with my healthcare provider before using piperacillin and tazobactam (PIPRANEM)? penicillin (Bicillin L-A, PC Pen VK, Pfizerpen), and others. if you are allergic to a cephalosporin antibiotic such as cefdinir (Omnicef), cefprozil (Cefzil), cefuroxime (Ceftin), cephalexin (Keflex), and others. FDA pregnancy category B. Piperacillin and tazobactam is not expected to be harmful to an unborn baby. Tell your doctor if you are pregnant or plan to become pregnant during treatment. Piperacillin and tazobactam may pass into breast milk and could harm a nursing baby. Do not use this medication without telling your doctor if you are breast-feeding a baby. How should I use piperacillin and tazobactam (PIPRANEM)? Piperacillin and tazobactam is injected into a vein through an IV. You may be shown how to use an IV at home. Do not self-inject this medicine if you do not fully understand how to give the injection and properly dispose of used needles, IV tubing, and other items used to inject the medicine. Piperacillin and tazobactam must be given slowly, and the IV infusion can take at least 30 minutes to complete. Piperacillin and tazobactam must be mixed with a liquid (diluent) before using it. If you are using the injections at home, be sure you understand how to properly mix and store the medication. Prepare your dose in a syringe, IV bag, or infusion pump only when you are ready to give yourself an injection. Do not use the medication if it has changed colors or has particles in it. Call your doctor for a new prescription. Piperacillin and tazobactam is usually given for 7 to 10 days, depending on the infection being treated. Follow your doctor’s instructions. This medication can cause unusual results with certain medical tests. Tell any doctor who treats you that you are using piperacillin and tazobactam. Store unmixed medicine and the liquid diluent at cool room temperature. What happens if I miss a dose (PIPRANEM)? What happens if I overdose (PIPRANEM)? Overdose symptoms may include severe anxiety, agitation, feeling restless or nervous, or seizure (convulsions). What should I avoid while using piperacillin and tazobactam (PIPRANEM)? What other drugs will affect piperacillin and tazobactam (PIPRANEM)? another antibiotic such as kanamycin (Kantrex), neomycin (Mycifradin, Neo Fradin, Neo Tab), paromomycin (Humatin, Paromycin), streptomycin, tobramycin (Nebcin, Tobi). This list is not complete and other drugs may interact with piperacillin and tazobactam. Tell your doctor about all medications you use. This includes prescription, over-the-counter, vitamin, and herbal products. Do not start a new medication without telling your doctor. tell your doctor and pharmacist what other prescription and nonprescription medications, vitamins, nutritional supplements, and herbal products you are taking or plan to take. Be sure to mention any of the following: aminoglycoside antibiotics such as amikacin, gentamicin, or tobramycin; anticoagulants (‘blood thinners’) such as heparin or warfarin (Coumadin, Jantoven); methotrexate (Otrexup, Rasuvo, Trexall), probenecid (Probalan, in Col-Probenecid); or vancomycin (Vancocin). Your doctor may need to change the doses of your medications or monitor you carefully for side effects. Keep all appointments with your doctor and the laboratory. Your doctor will order certain lab tests to check your body’s response to piperacillin and tazobactam injection.